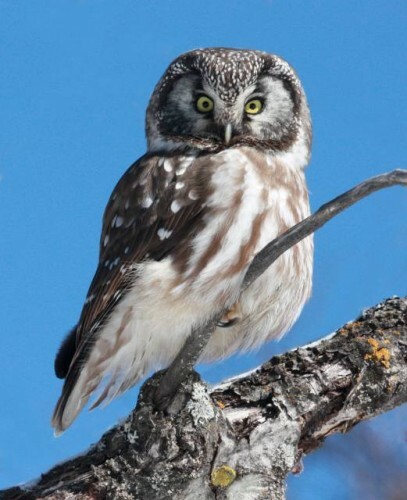 Boreal Owl photographed by John Cassady. Of the northern owls, I have seen numerous hawk and great-grays but only two boreals. One would readily stick its head out of a nest hole while the other was along Rt, 41 where a waiting birder pointed it out to my group. When Lizzie and I met on February 15, I was surprised to learn to that although she had already seen at least two boreals within the past week or so, she still had not crossed paths with a great-gray. So we headed out in late afternoon to Rt 41, which goes north along the Lake Superior shoreline, in search of owls. Looking down a short road to the lake we spied that tell tale sign that a good bird was present: several cars and birders. Sure enough they were watching two great-grays and Lizzie had her lifer. Next morning we repeated the route and found yet another great-gray. This weekend coincided with the Sax-Zim bird festival which, along with the owls, brought brigades of birders from all over. We ran into Chicago friends, Bob Hughes and Karen Mansfield. One of Duluth’s premier birders and a friend of Lizzie, Erik Bruhnke was leading a group. With both we agreed to share info if we found a boreal. Well Lizzie pulled off a feat that I still find amazing. If a boreal is facing you while perched on an exposed branch as you drive slowly down a road, you have a chance of discerning it. But my sharp-eyed friend actually spotted a boreal with its back to us. We stopped started calling to the other folks and in no time we had a horde of birders milling around. And among them was my Indiana birding buddy John Cassady and his wife Wendy. A really wonderful moment. Several months have now passed. And the owls seem to have departed. But Lizzie recently posted on Facebook that she just accomplished a long held aspiration: on May 4, enough snow remained in Duluth that she was still able to ski. 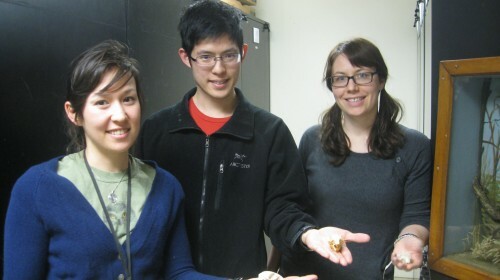 Lizzie Condon, William Chen, and Katie Lassi. 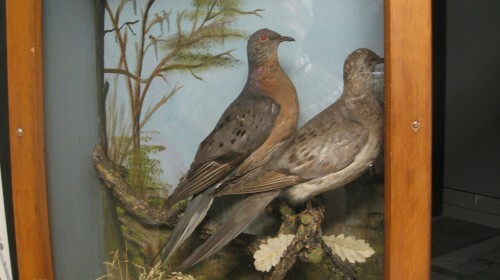 Two passenger pigeons in the collection of the University of Minnesota at Duluth.